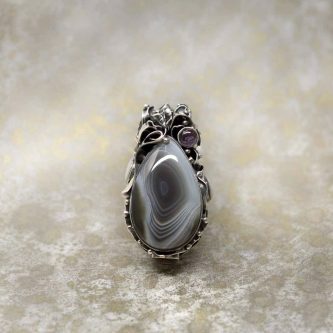 Gray agate is an anti-anxiety stone. It has a positive affect on emotions and attitudes, balancing nerves and healing anxiety. It helps with nightmares and nervousness, bringing peace into worried minds. If worn continuously, this stone melts stress and brings emotional calmness and mental clarity. As a communication stone, it gently guides its wearer to the resolution of conflicts and restores inner peace. It vibrates with a low calming note, providing a strengthening and stabilizing influence by balancing the physical, emotional, and mental components of its wearer. Physically, gray agate repels worry and confusion at a cellular level, helping to prevent cancer and making it harder for existing cancer to grow. It supports the reproductive system and invigorates the digestive system.